The impact of the mobile in the travel industry is higher than ever, so much that the smartphone has become the essential tool for connected travelers. In 2017, 79% of the travelers booked a stay, plane tickets or touristic activities after doing researches on their smartphone — this figure rises to 83% for business travelers. This smartphone trend, prevalent for our travelers, is closely linked to the evolution of the technologies that impacts the behaviour and the purchasing process. According to Booking, 1 trip out of 2 starts on a mobile. Indeed, more and more travelers use their smartphone to get direct information about their destinations — and this won’t change anytime soon — Google announced a 18% rise on smartphone travel requests for 2018. For Lisa Gevelber, Google marketing vice-president, the new mobile behaviours are creating a new shopping process. The micro-moments — these time T where the desire to travel appears — happen during the consumer path. They begin when people start dreaming about a trip, during the planning, the booking and even during the trip. Before the trip, hotel and plane tickets researches have become as common as doing shopping on a smartphone. In France, 44% of the research for a new destination are done on a mobile, 27% in Germany, 45% in England/United Kingdom, 59% in Japan and 48% in the United States. 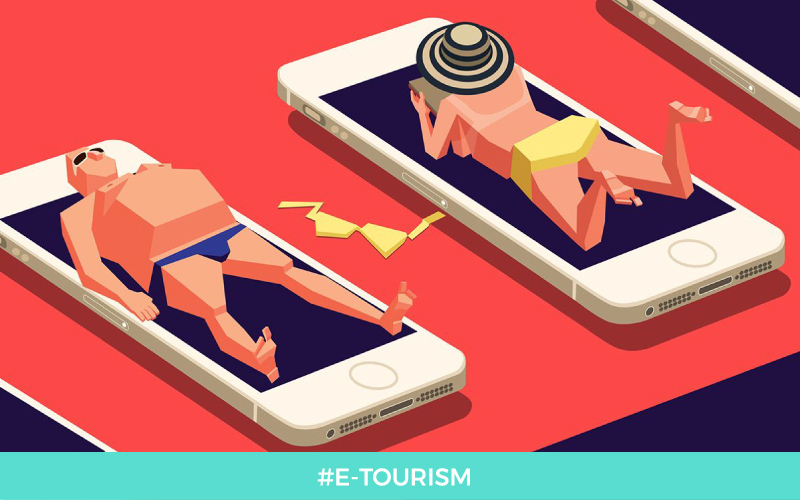 During the trip, 70% of tourists automatically use their smartphones to look for touristic activities and attractions, to locate shopping areas and restaurants or even to look for their routes. If your brand is missing in the travelers micro-moments, you have missed potential customers. Today’s travelers turn to their smartphone to be inspired and to take decisions. The brands that help them in these moments win their heart, and their dollars. All the digital marketing stakes in the travel industry are to adapt to these new behaviours and to catch the travel moment, the key time T in our travelers purchasing process. The journey planning is an important travel moment for brands, travelers can be influenced by social media, tourist guides content, whether paper or digital, but also by promotional offers, and this even during their flight. You have to know that on board, nearly 94% of the passengers have a smartphone or a tablet and nearly 85% of them plan their journey by booking activities when they arrive at their destination. The communication mediums in the planes are no longer just great journey invitations, they become the first step of the touristic experience by helping travelers to get all the information they need to plan their stay rapidly and easily. One of the mistakes made by many travel brands is for the mobile to offer the same features as a computer. Even if booking is important, other actions or micro-conversions on a mobile, such as promotional offers downloads or email registrations can have a measurable impact on the commercial results. Without further ado, discover how to appear on the travelers mobile during their flight!